With Father’s Day around the corner, it’s time to start planning a menu for the big day – after all, you should have plenty of time on your hands to plan an elaborate meal for Dad, especially since the kids are home from school on summer break and your days are freed up from PTO duties (NOT!). No seriously, time never seems to slow down -that’s for sure. Since we can’t seem to fit another minute into our already busy schedules, we wanted to keep things simple -and indoors. 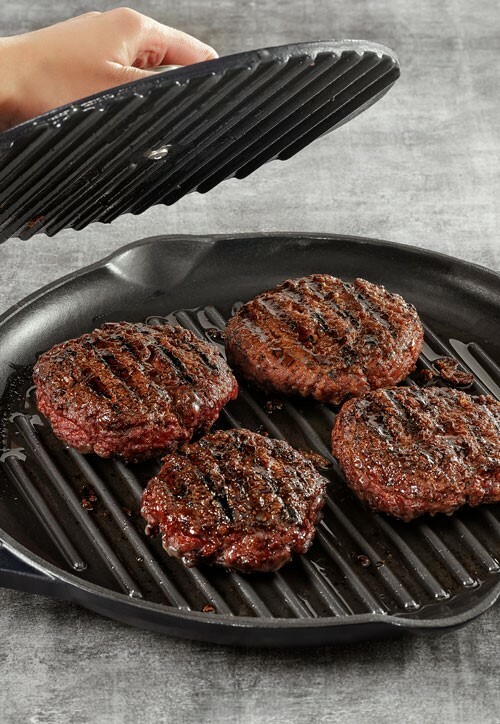 Using our exclusive Bel Piatto™ cast iron grilling products, we were able to create succulent, easy-to-grill burgers, just for Dad. And, because the summer heat can drain the life out of anyone (ain’t nobody got time for that! ), our Bel Piatto™ Round Enameled Cast Iron Grill Pan seemed to be the perfect sous-chef for this air-conditioned occasion. The truth is, not everyone is a grill master. And, who really wants to stand beside a fire-cannon of flames in the blazing summer heat? Not us. Take a peek at our recipe and amazing grilling items below (yep, school fundraising items you’ll actually use!) for a simple, indoor-grilling experience you can easily re-create on Father’s Day (or any time of year)! 1 red onion, sliced into rings 1 whole pineapple, peeled, cored and sliced into rounds. Cut 4-5 round slices in half. Set stove top (or gas cook top) on medium heat. In a large bowl, use hands to mix ground beef, salt and pepper. Pat beef into 4 large patties. 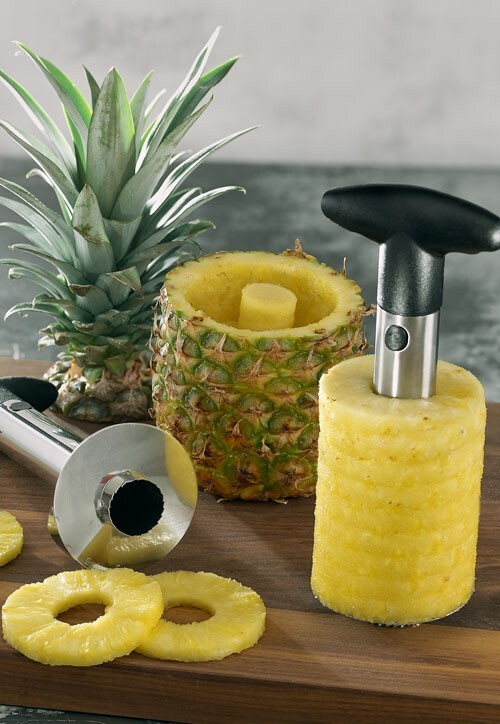 Set burgers aside on a covered plate while you prepare to grill your pineapple slices. one side. Flip the pineapple slices and grill for another 1-2 minutes. Remove pineapple slices from grill pan, and cover to keep warm (we used aluminum foil). 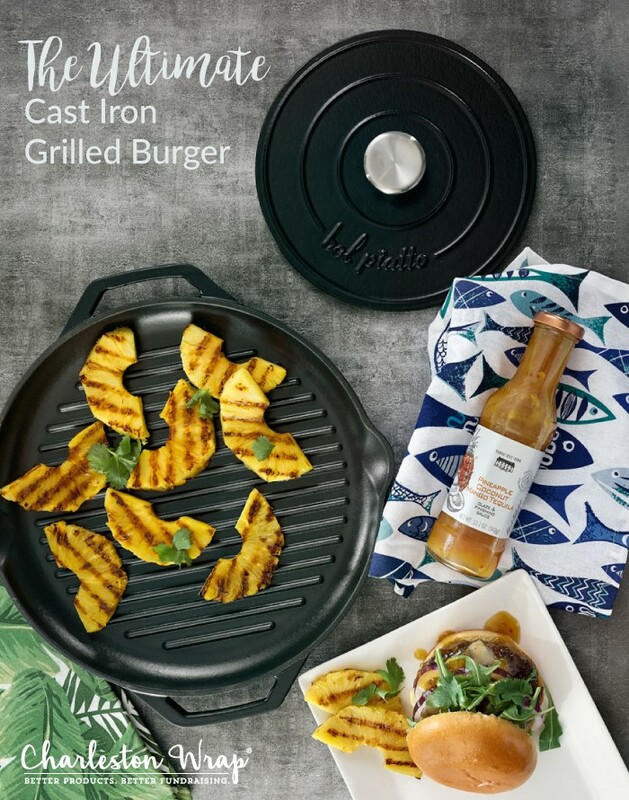 Place burgers on your grill pan and paint burgers with Pineapple Coconut Mango Tequila glaze & finishing sauce. Press burgers using the Bel Piatto™ Round Enameled Cast Iron Grill Press. Grill for 5 minutes. 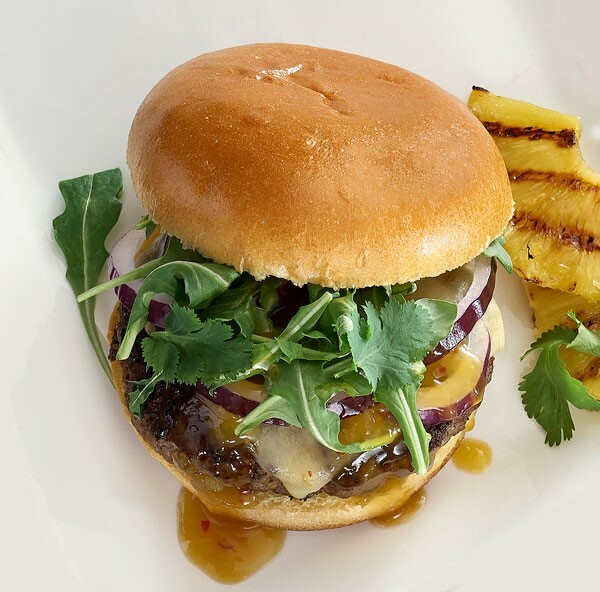 Flip burgers and paint again with more Pineapple Coconut Mango Tequila glaze & finishing sauce. Place grill press on top of burgers again. Grill and cook another 3-5 minutes or until cooked to desired temperature. Remove burgers from grill onto clean plate and add sliced cheese. Let rest for 5 minutes, allowing cheese to melt. Start building your burger! Top with pineapple slices, lettuce, red onion. If desired, drizzle with more Pineapple Coconut Mango Tequila glaze & finishing sauce. Pair will leftover grilled pineapple slices and enjoy your succulent, mouth-watering Cast Iron Grilled Tropical Cheesy Burgers! You certainly don’t have to be a grill master to create a delicious burger! When you offer parents a fundraiser with quality items they’ll actually want and use, your fundraising goals can easily be met (and even exceeded). If your school or parent group is in need of fundraising programs, be sure to connect with Charleston Wrap® for your free-info kit and we’ll help find the right fundraising campaign for you. Need extra planning help? 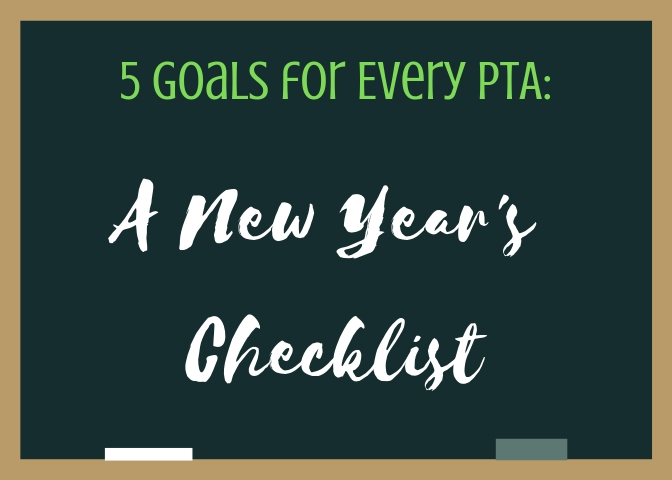 Check out the 5 Steps to Planning Your School Fundraiser: How to Get Started.